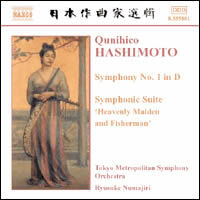 Qunihico HASHIMOTO: Symphony No. 1 in D Major (1940); Symphonic Suite: Heavenly Maiden and Fisherman (1933). Tokyo Metropolitan Symphony Orchestra, Ryusuke Numajiri (cond.). Naxos 8.555881 (http://www.naxos.com/). “Tradition and Avantgarde [sic] in Japan.” Toshio HOSOKAWA: Nocturne (1982); Banka (1989); Koto-uta (1999). Yoshizawa KENGYÔ II: Chidori no kyoku (ca. mid-19th cent. ); Yatsuhashi KENGYÔ: Hachidan no shirabe (ca. mid-17th cent. ); Yamada KENGYÔ: Nasuno (ca. 1800). Sumi Tan (voice, koto), Makiko Gotô (koto, jûshichigen), Hideko Yamagishi (koto), Michiyo Kasuma (shamisen). col legno WWE 1CD 20057 (http://www.col-legno.de/). Distributed in the US by Qualiton (http://www.qualiton.com/). Bridging Debussy and Noh, the elegant Toru Takemitsu (1930 – 1996) is probably the 20th century’s most familiar Japanese composer. Hashimoto and Hosokawa, composers who at first glance couldn’t be more different, are less well known. The short-lived Kunihiko Hashimoto (1904 – 1949), notwithstanding wide-ranging interests and abilities, was obligated to be a nationalist composer. The prominent Toshio Hosokawa (b. 1955), electing to work with his culture’s materials, has a distinct and individual voice. Although they both studied in Europe, the two men were exposed to different educational missions. Hashimoto would assimilate himself into the Western aesthetic, whereas Hosokawa’s European teachers encouraged him to consider his identity and culture. Kunihiko Hashimoto (Naxos spells his first name alternately as Qunihico) began as a popular-music composer in the 1920s. He broadened his style by developing a Japanese flavor of sprechstimme. Despite an open flirtation with atonality and microtonality, he became a professor at the conventional Tokyo Music School, demonstrating an ability to balance contradictory styles. Between 1934 and 1937 he worked with Egon Wellesz in Vienna, also befriending Ernst Krenek and Alois Hába. He met Schoenberg in Los Angeles on a stopover to Japan. Curiously, despite an awareness of Schoenberg and Hába’s work, Hashimoto penned mightily conservative orchestral music. He ignored avant-garde trends completely, preferring to validate Japanese music within the turn-of-the-century European context. Though his music does incorporate native melodies and harmonies, he didn’t “discover” an ethnic style as did Bartók, Kodály or Szymanowski. Written before his European studies, the efficient suite from his fourth ballet, Heavenly Maiden and Fisherman, sounds like European music with an oriental flavor. This could be Rimsky-Korsakov, Arthur Sullivan, or anyone with solid Western training and an ear for the East. Perfect for Brighton’s Royal Pavilion! Cleanly and energetically played, the suite’s seven movements tumble past without a wrinkle, familiar harmonic progressions supporting piquant melodies. Nothing to ruffle one’s feathers here. Among the most wondrously strange orchestral music ever recorded, the First Symphony reveals Western biases about nationalist music. We expect foreign melodies to be bowdlerized to fit European harmony and forms. Thanks to radio airplay, we’re accustomed to the corny and reassuring Scandinavian nationalism of Grieg and Sibelius. Copland’s overt American stereotypes, now abused in TV commercials, trouble no one. Written in 1940 as Japan began to modernize and assert itself on the world stage, the First celebrates the 2600th anniversary of the country’s foundation. At this distance, the work sheds the trappings of enforced nationalistic realism more effectively than do Shostakovich’s symphonies. Hashimoto has penned a curiously arranged marriage of European orchestra and counterpoint — among the West’s most exalted products — with Japanese songs, colors and Gagaku (traditional court music). Incorporating a sonata-allegro modeled on emakimono, a style of scroll painting that intersperses images with written narrative, the symphony begins and ends impressionistically like fog passing momentarily to reveal a mountain landscape. The movement alternates tranquil oases with lush outbursts, including quirky harmonies and a startling Sousa-like march. Pleasant tunes border on film-music schmaltz: Korngold having imbibed too much sake. In the wondrous second movement — the “You gotta hear this!” — solo winds pass around a delightfully simple air ornamented and supported in a non-Western manner. A trio section introduces flashier material. Pentatonic melodies and unusual percussion weave through Hashimoto’s turn-of-the-century romanticism. A magical passage occurs at 8:55 when the full orchestra takes up the first theme in parallel fifths. The third and final movement is a theme and eight variations capped with a fugue. The European foundation is less distorted here. Condescending listeners playing the “Who does this sound like?” game will be missing the point. Hashimoto’s First is a distinctive amalgam of two venerable traditions. By comparison, Hovhannes, Harrison and Cowell, all of whom fashioned similar mixtures, are but flashily dressed tourists with cameras. Morihide Katayama, Naxos’ exemplary annotator, fudges politics’ influence on Hashimoto’s life and music. We learn that stress took its toll on his health and mental well-being. What must he have seen and felt in xenophobic and racist Vienna? With Wellesz he discussed nationalism and “international atonalism” (Katayama’s phrase), and he attended concerts led by Toscanini and Furtwängler, maestros with vastly different coping strategies for the changing political realities. Hashimoto must have reflected some equanimity as the displaced Schoenberg did consent to a visit. On returning to Japan, as the First suggests, he served the state. After WWII, he left his teaching position, “accepting responsibility for his wartime musical activities,” but was still compelled to represent the fatherland: The Second Symphony celebrates Japan’s new democratic constitution. As always, Naxos’ production qualities and reasonable sticker price encourage this rewarding exploration. The Tokyo Metropolitan Symphony plays with conviction under Ryusuke Numajiri’s leadership. I hope that Naxos’ release of Symphony No. 2 is just around the corner. Col legno’s disc is a more significant investment. 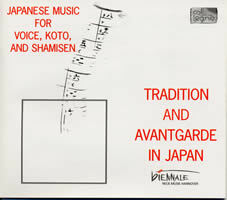 Recorded live at the 1999 Biennale Neue Musik Hannover, here are crisp performances of old and new works for combinations of voice, koto (Japanese zither), shamisen (Japanese lute) and jûshichigen (a larger koto with 17 strings). The players switch genres adeptly. Perhaps only experts will hear period differences in the three classical Japanese works spanning 200 years. Two are poem settings, the third instrumental. Similar scales, playing methods and a delicacy pervade these calming pieces. Toshio Hosokawa’s initial music education in Japan followed the predominant Western model. In 1976 he went to Berlin to study with noted composer Isang Yun, a Korean who encouraged him to consider what it means to be Japanese. Yun’s very presence in Berlin was an unambiguously defiant statement. He had been kidnapped by the Korean secret police in 1967 and transported back to Seoul where he was imprisoned and tortured. International outcry and the unusual activism of fellow composers secured his 1969 release. Yun also made Hosokawa aware of the friction between Korea and Japan. Klaus Huber, his next teacher, suggested he investigate Japanese classical music. It was thus in Europe that Hosokawa began to explore Japanese culture, and there that he began to develop a distinct voice. The three works from Hanover include a dark and earthy Nocturne, his first for the husky-sounding jûshichigen, and the world premiere of the rhapsodic Koto-uta for voice and koto. Microtones, slides, irregular metrics and other characteristic 20th-century emblems predominate. Clearly these are modern works for Japanese classical instruments, but you might not think their composer to be Japanese, so universal is Hosokawa’s language. Interesting and well-performed, these three pieces are a tricky introduction to Hosokawa’s art. Fortunately he is well represented on CD. 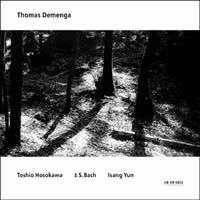 ECM 1782/83, the double-CD conclusion to Thomas Demenga’s traversal of Bach’s cello suites, includes magical performances of In die Tiefe der Zeit (1994), for cello and accordion (who else but Teodoro Anzellotti), Winter Bird (1978), for violin solo (Asako Urushihara), and Duo for Violin and Violoncello (1998). Demenga’s other “outside” pairing for Bach is Yun. (Veress, B.A. Zimmermann, Carter and Holliger were matches on previous installments.) I recommend the set wholeheartedly for the Hosokawa, less so for the Yun, who merits greater championing. I recognize that Demenga is among the first to have presented such starkly contrasting programs, but I’d rather hear Ralph Kirshbaum’s Bach any day (Virgin 7243 5 45086 2 2). ECM’s characteristic sound works well with Winter Bird’s intensity, contributing special resonance to its pizzicato. The Arditti Quartet works through five pieces from 1989-94 on Montaigne MO 782078. Three call for guests. Arditti alone appears with pianist Ichiro Nodaira in Vertical Time Study III (1994). Landscape I (1992) is for standard quartet, Fragmente II (1989) adds alto flute. In Landscape II (1992), the fifth component is harp, and in Landscape IV (1993), it’s shô. Mayumi Miyata plays the Japanese mouth organ in the disc’s most captivating work. (She’s the shô player on mode and hat[now]ART’s Cage recordings.) The shô with its eerie reedy clusters magically intertwines with the four strings. A work for Japanese instruments, New Seeds of Contemplation (1986/1995), occupies part of the 1995 Donaueschinger Musiktage brick, col legno WWE 3CD 31898. At 47:23, it has significant mass. Scored for shômyo and gagaku orchestra, including a shô soloist (Miyata again), this Buddhist ritual requires stage movements and spatial arrangements which of course are lost on a recording. Nonetheless, it is an overwhelming and absorbing work. I sense that the live, surprisingly quiet audience was transfixed. 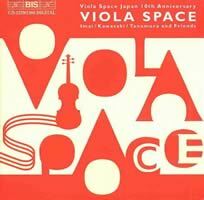 Voyage VI (2002), for viola with string orchestra, is on the just-released Viola Space Japan 10th Anniversary (BIS CD 1379/1380). Hosokawa has written an intense and enthralling journey, destined to be among this century’s finest viola concertos. He tells us that “the soloist symbolizes man while the ensemble represents the universe, nature and world that surround us within and without.” Indeed the viola seems to stand still while the string orchestra circles about, especially at the conclusion’s atmospheric glissandos. Nobuko Imai is the soloist with the Toho Gakuen Orchestra under Koichiro Harada. Other pieces in this must-have set are by Penderecki, Kurtág, Nørgård, Porter, Partos, Ligeti, Benjamin, Hayashi and Schnittke. Hosokawa’s incorporation of Japanese instruments, neither opportunistic nor folkloric, represents a heartfelt and consistent expansion of his art. Many composers, including Chen Yi, Tan Dun and Oswaldo Golijov, have attempted to combine their cultures with European forms and traditions. Such music may be fashionable, but the results are largely disingenuous, with chintzy veneers veiling fundamental flaws in their creators’ abilities. The non-European effects succeed in dressing up insubstantial doodles about as much as powdered sugar adds nutritional value to a donut. There are plenty of ways to mix East and West. As Hashimoto and Hosokawa show, only a few will endure.